Some of the publication issued by the Society are featured here. There are other publications now out of print, which may sometimes be obtained through a note on a newsletter, or the BGS email group. Alternately some publications may be obtainable from 2nd hand booksellers. If sufficient interest is found for certain BGS publications, they may be reprinted. If you are interested in a particular Broad Gauge publication, please drop a line to the BGS Publications Officer. 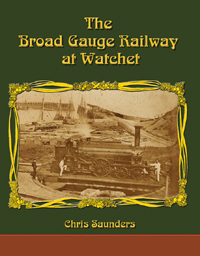 The Broad Gauge Railway at Watchet - A book by BGS member Chris Saunders whose 20 year project brought together a wealth of information about the early railways and development of the harbour at Watchet. Watchet was initially a terminus for the Bristol & Exeter line from Taunton, serving passengers and freight, until the line was extended to the destination of Minehead in 1874. Happily the period was recorded by a few individuals who took up photography even though it was in its infancy. Chris has been able to gather many of these images to form a collection showing development of the broad gauge railway, the harbour, and significant buildings constructed around the 1860s. To these Chris has added captions that explain details in the photographs. Reference ISBN13 : 9781911038085 - 64 pages; published by Black Dwarf Lightmoor, this book can be obtained on-line. It is also be available for purchase from our Publications Officer at a discounted rate to members (for U.K.). Broad Gauge Locomotives - Written by Geof Sheppard with assistance from Brian Arman and Paul Garnsworthy; this is a definitive book listing all known 7ft gauge locomotives. This includes those owned by the Midland Railway, the London and South Western Railway, as well as the Great Western Railway and companies it absorbed. It is copiously illustrated and includes details of the classes, major dimensions, names/numbers and build dates; and is printed on high quality glossy paper with colour covers. The book was published in association with Kevin Robertson under his "Noodle Books" imprint. This book is available for purchase from our Publications Officer. 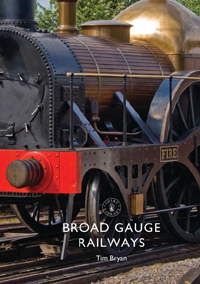 NEW - Broad Gauge Railways - a 2018 publication by Tim Bryan, who worked as curator at the GWR and STEAM museums in Swindon for more than 20 years. His book describes how Isambard Kindom Brunel considered the Great Western Railway the 'finest work in England' and how he implemented many groundbreaking features, though non so unorthodox as the decision to introduce the new 'broad gauge' of 7ft 1/4in. Describing the rationale behind the choice of broad gauge, and also the unique track and locomotives used, this is the history of Brunel's great brainchild. The illustrated publication chronicles the construction of the initial GWR line from Bristol and London, and the expansion of the original 112 mile long main-line into a newtwork stretching across the West of England and more. It also describes how the clash between broad and narrow led to the 'Battle of the Gauges, and ultimate demise of the broad gauge. A Broad Gauge Album - When a visitor to Newton Abbot's Town and GWR Museum produced an album of railway photographs dating from the latter part of the last century, curator Felicity Cole soon realised that she had an important find on her hands. The album proved to contain a substantial photographic record of the final years of the broad gauge, with many of the photos relating to Newton Abbot, and the final gauge conversion of the South Devon Railway main line and Torbay Branch. The owner of the album lent the collection to the museum, and copies were made for the GWR museum's archive. The museum then invited local historians and the members of the Broad Gauge Society to examine the material, and the published album presents a selection of the photographs, with caption material provided by these researchers. (A number of the photographs were featured in a large 2006 display, celebrating the 150th anniversary of the arrival of the GWR in Newton Abbot.) This album is probably the most comprehensive published record of Brunel's great vision as a working railway, as well as chronicling the conversion to "narrow" gauge. Compiled in association with BGS members, copies are available from the Newton Abbot Town Museum or the BGS. The Tiverton Museum Railway Collection. - The Tiverton Museum of Mid Devon Life houses more than one item of major significance to the transport historian. Foremost is a former G.W.R. locomotive that once operated on the now defunct and still lamented branch line to the town (the Tivvy Bumper). In addition there are a number of smaller exhibits, including a unique survivor from Victorian times: the notebook used by the engineer responsible for the building of the Exe Valley Railway. This remarkable document was found in, of all places, Australia, but is now secure in the museum. Within its covers are a series of wonderful drawings and contemporary notes, never previously available to the historian or local history enthusiast, but are brought to life in this book compiled by Great Western devotee, Amyas Crump. In addition to the records within the notebook, this book contains other examples, plans, photographs and documents from the museum and other private collections. The result is a wonderful archive to delight both the enthusiast and residents of the local area. This Limited Edition publication is compiled with the acknowledged assistance of the Tiverton Museum and the Broad Gauge Society. ISBN 978 1 906419 39 4 - b/w illustrations and plans - and is available from the BGS with a discount to members.